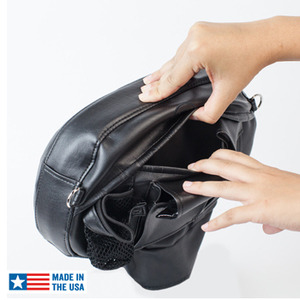 BM-001: The BM-001 Pocket features one large, secure interior pocket with flap enclosure and hook and loop fastening, so it's secure and sized just right for small valuables, like your wallet, glasses, keys and/or handgun. Easy zip-on and off design. Dimensions: 11.5 x 7 x 2" This model fits multiple backrests, including: Signature Series Seat w/ Rider Backrest (Softail), Short, Passenger Backrest Pads (Touring), H-D Adjustable Rider Backrest ('09-'15), H-D Fixed Rider Backrest ('09-'15), and some Round Bar Passenger Backrest Pads & some Mustang, Corbin and our 1660, 1661 driver back rests. BM-002: The new Organizer offers the same organization and convenience as the original, but with an even bigger secure pocket to accommodate larger smart phones and more. Adjustable cross-body strap is included. Easy zip on and off design. Fit may vary. Dimensions: 11.5" x 7" x 2" (9" base opening). This model fits multiple backrests, including: Signature Series Seat w/ Rider Backrest (Softail), Indian Rider Backrest ( black), H-D Adjustable Rider Backrest ('09-'15), H-D Fixed Rider Backrest ('09-'15), and some Passenger Backrest Pads (follow the dimensions). Most Mustang, Corbin and Kuryakyn driver back rests. 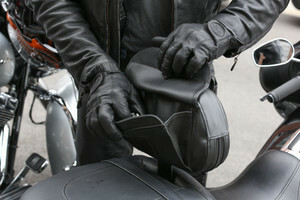 BM-004: Fits larger current passenger pads and Rider backrest pads. 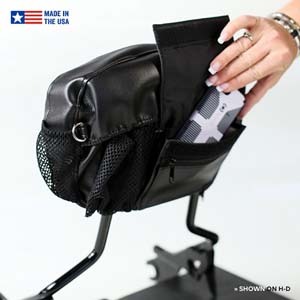 This newest Organizer offers the same organization and convenience as the regular Organizer but we made it even BIGGER; 3 pockets including an even larger secure pocket to accommodate larger smart phones with smaller zipped pocket for your license, money or CC. 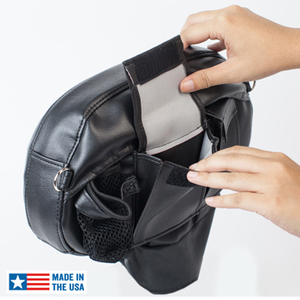 Two mesh pockets for water bottle and more. 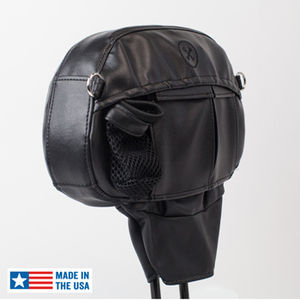 Cross shoulder adjustable strap included for use on and off the bike. Easy zip-on and off design. Weather resistant. Dimensions: 12.5' x 8.5" x 2.5" ( 9" base opening) Made in the USA. Organizers FIT:COBRA Passenger Backrest -'09 to present, H-D Passenger Smooth Stitch Backrest - '09 to present, Our Police Rider Backrest ( for Metrics and V-twin), Various Metric backrests, Victory and more (follow the dimensions listed above). BM-V: FINALLY, it's here and worth the wait! 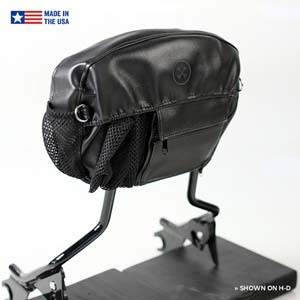 The new Vintage Back Rest Organizer offers the same organization and convenience as the original, but fits 2008 and "older" H-D touring driver back rests. 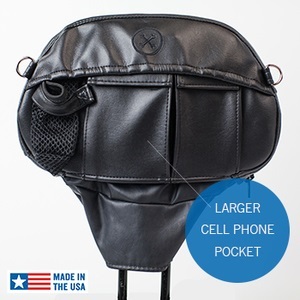 The Vintage Backrest Organizer has an even bigger secure pocket to accommodate larger smart phones and more! 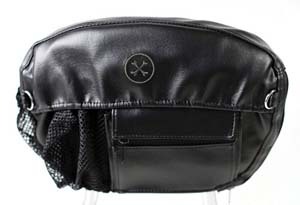 Adjustable cross-body strap is included. 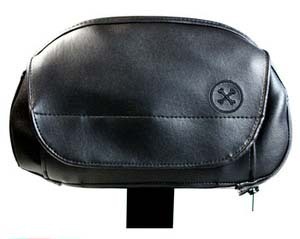 Fits H-D Fixed or Adjustable Rider Backrest, 2008 and older. Fit may vary. Dimensions: 13" x 9" x 4" (9" base opening). 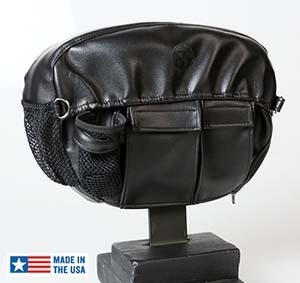 This model fits multiple backrests, including: Mid-size H-D Passenger backrests, H-D Adjustable Rider Backrest ('08 and older), H-D Fixed Rider Backrest ('08 and older), and some Mustang, Corbin and Kuryakyn driver back rests.